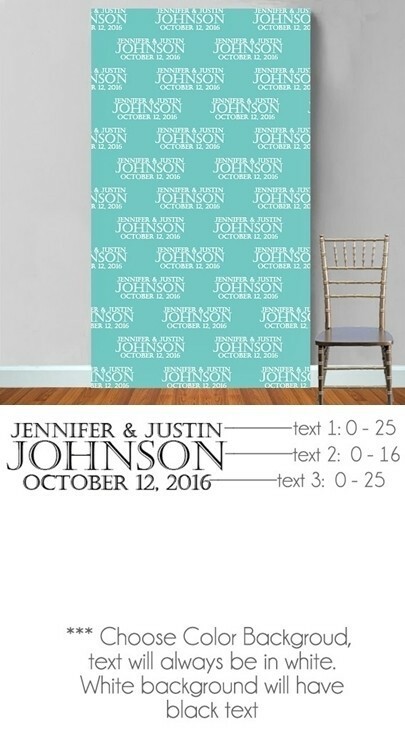 This terrific photo backdrop features an elegant repeating brides and groom's names, their last name and wedding date motif in block letters is printed in white on your choice of 27 background colors. The design begins 1" inch from the top edge of backdrop. Available only in the pictured colors. The backdrop is made of high-quality, lightweight, tear- and fade-resistant, flexible scrim-vinyl material with a smooth matte coating to reduce glare caused by camera flashes. Fire retardant material meets NFPA701 code.